Veniard SLF 2 Dispenser - A mix of 12 of the brighter more vibrant SLF colours. Veniard SLF 1 Dispenser - The first and most popular of the Synthetic dubbings. Its translucence will add life to any fly. 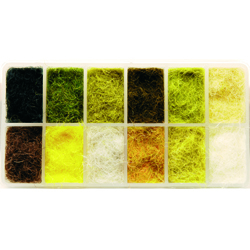 Saltwater SLF Blends Dubbing Dispenser - 12 Blended colours specifically designed for saltwater flies.Pearl, Sand, Tan Watery Olive, Smokey Olive, Fl. Chartreuse, Fl. Yellow, Fl. Red, Root Beer, Soft Shell, Fl. Orange & Burnt Orange. 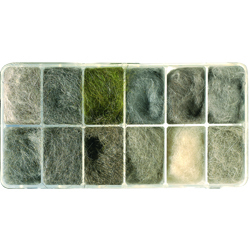 Natural Furs Dubbing Dispenser - Contains Light Hares Mask, Dark Hares Mask, Olive Hares Mask, Muskrat, Mink, Coyote Mask, Camel, Australian Opossum, Fox Squirrel, Grey Squirrel & Pine Squirrel. 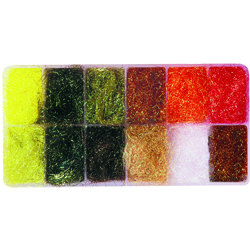 Lite Brite Dubbing Dispenser - A pearlised tinsel that's fine enough to be dubbed straight on to the hook resulting in flies that shine & glisten in the water. 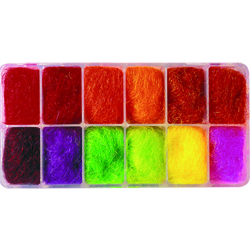 The Lite Brite Dubbing can also be combined with natural furs to give flies, nymphs and pupae shining highlights that prove attractive to trout. The dubbing will also enhance sea trout, steelhead & salmon patterns. Kaufmann SLF Blend Dubbing Dispenser - 12 Colours created by Randall Kaufmann. Golden Stimulator, Black Stimulator, Flame Stimulator, Wine Mini Leech, Tan Scud, Olive Scud, Brown Olive Dragon, Olive Stone, Tan Stone, Golden Stone, Browne Stone & Black Stone. 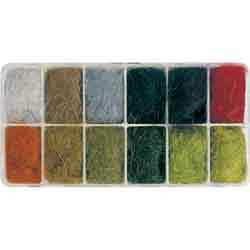 Hare Dubbing Dispenser - 12 colours of hare fur dubbing, a classic standard dubbing blended with SLF. 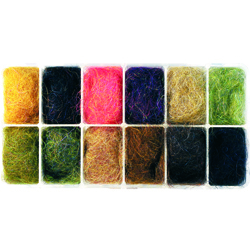 This dubbing has a wide range of uses from large buggy patterns to small nymphs, Emergers & gold heads.Hare dubbing colours included; Light olive, Green Olive, Dark Olive, Brown Olive, Golden Olive, Orange, Red, Claret, Black, Grey, Med Brown, Natural, Hare. Glister Dubbing Dispenser - The best synthetic dubbing. A fantastic product from Veniard. 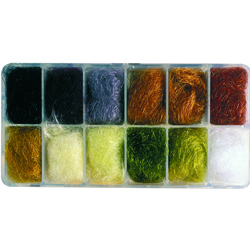 CDC Dubbing Box by F McPhillips - 12 Colours of shredded CDC in a dispenser box. 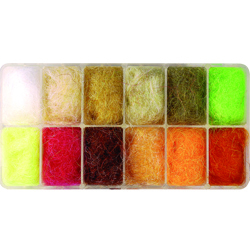 Designed specifically for dry fly patterns, this CDC dubbing offers an exceptional addition to the fly tiers armoury. It is unbelievably light, physically, and will alight the fly like the piece of feather down it is!Contains the following CDC colours:Black, Green Olive, Light Olive, Brown Olive, Medium Olive, Summer Duck, White, Mayfly Olive, Golden Yellow, Grey, Yellow, Sedge Brown. 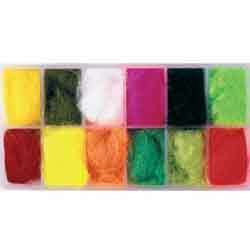 Antron Dubbing - A Great Value soft and translucent synthetic dubbing dispenser from the popular brand - Veniard. 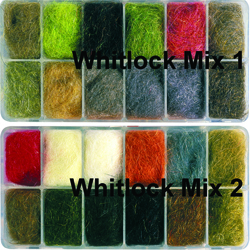 Whitlock SLF Mix 1 or 2 Dispenser - Box 1 (Mix1): Scud & Shrimp Grey, Scud & Shrimp Olive, Scud & Shrimp Orange/Pink, Scud & Shrimp Tan, Sowbug Grey, Sowbug Tan, Red Fox Squirrel Abdomen, Red Fox Squirrel Thorax, Damsel Tan, Damsel Olive, Dragonfly Dark & Dragonfly Olive. Superfine Dubbing 1 or 2 Dispenser - A permanently waterproofed extra fine material that makes really tight bodies. 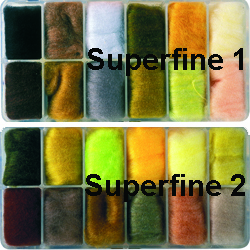 Superfine Box 1: Brown, Blue Dun, Blue Winged Olive, Amber, Light Cahill, Hendrickson Pink, Pale Evening Dun, Olive, Adams Grey, Brown Olive, Mahogany & Black. Superfine Box 2: Blue Winged Olive, Golden Olive, Fl. Chartreuse, Sulphur Orange, Pale Yellow, Pale Morning Dun, Tan, Cinnamon Caddis, Grey Olive, Brown Olive, Dark Tan & Rusty Brown. Frankie McPhillips Traditional Irish Dubbing box - Frankie McPhillips Irish dubbing dispensers. 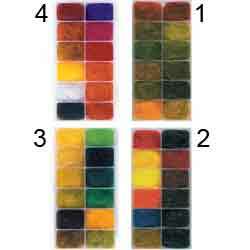 4 boxes available each containing 12 colours taken from his Irish Dubbing collection (a total of 48 colours), also available individually in packets. Seals Fur Genuine - Dispenser, choice of two. 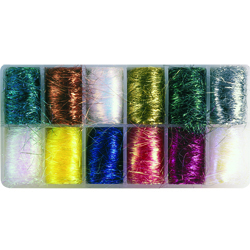 Seals Fur is one of the best and famous dubbing materials for fly bodies, in particular dry fly bodies and nymphs. Choose between Number 1 & Number 2. Seals Fur Genuine - Dispenser 1 - in a convenient dispenser box: - Contains :- Orange, Med. Olive, Fiery Brown, Cream, Black, Yellow, Lt. Olive, Claret, Dark Olive, Golden Olive, Green Highlander & Red. 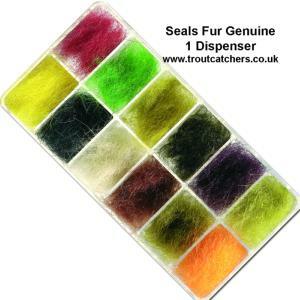 Seals Fur Genuine - Dispenser 2 - in a convenient dispenser box: - Contains :- Grey - Fl. Red - Lt. Claret - Fl. Orange - Fl. Yellow - Chartreuse - Brown Olive - Ginger - Sunburst Yellow - Fl. Green & Blue Dun.